Represent your favorite pup in these Golden Retriever Slippers by Silver Lilly! 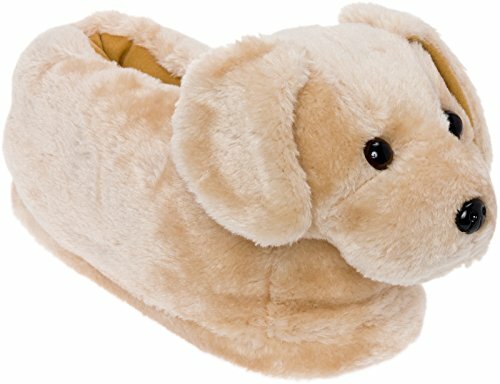 These adorable dog slippers are ultra soft and comfortable enough to lounge around in for hours.The extra cushioned upper features a precious retriever's face, and a gripped outsole keeps your feet firmly in place on slippery wooden and tile floors. The Ultra Soft, cushioned padded footbed adds additional support, keeping you comfortable even on harder surfaces. Great for dog lovers of all ages, these fun slippers are a wonderful way to show off your favorite breed! Available in sizes Small, Medium, Large, and X-Large. PERFECT FOR GOLDEN RETRIEVER LOVERS - Each slipper features a picture perfect golden retriever face on the upper, making it the ideal slipper for those who love man's best friend. Make any dog lover's dream come true!